Start a Non-Medical Home Care Business with expert guidance from our Home Care Consultants. Interested in starting a Skilled (Medical) Home Health Agency? Click here. We are the largest home care consulting company in the industry. We’ve worked with home care agency startups in every state and guarantee our home care business startup process. There is no better company to work with in starting your very own Home Care Business. Established in 1995, our consulting company has been in business for more than 20 years! We have assisted well over 3000 home health care business startups. We’re proud to employ a team of 50 full-time employees, all with specific fields of expertise. We have 8 Masters-Prepared Registered Nurses on staff. Among these Registered Nurses is our CEO, Rosina McFadden, a former Senior CHAP (Community Health Accreditation Program) Accreditation Site Surveyor of 15 years. She pioneered New York’s Long Term Home Health Care Program, which has become the model for home care as we know it today. We have helped well hundreds of individuals just like you open new home care businesses. Our turn-key new home care agency startup process insures that you will have a successful home care business. "Being a member is...the best thing that ever happened to us"
"If you are considering a consulting firm, use no other"
21st Century’s non-medical Home Care Business Startup Process includes the completion of your state's home care license application and all of the required home care business license paperwork requirements for you. 21st Century’s Home Care Business Startup Process begins with incorporating your home care business and obtain a Tax ID and NPI number for your home care business. Every state has different home care license and operation requirements and standards. Our home care consultants understand the requirements of all states and are able to assure you will achieve home care business licensure using our home care policies & procedures and home care consulting services. 21st Century’s non-medical Home Care Business Startup Process includes home care policy and procedure manuals that are written to meet state standards and customized to your home care business including your home care business logo, staff and office details. Along with your customized, state specific home care policy and procedure manuals, 21st Century’s Home Care Business Startup Process also includes all of the operation forms and documents you will need to operate your home care business and stay compliant with State and Federal regulations. Our core personnel are former CHAP Accrediting Body Senior Site Supervisors. We train your staff to eliminate home care accreditation deficiencies and pass their home care accreditation site survey inspection. We complete an ON-SITE Mock home care accreditation audit at your location. This on-site audit includes a complete review of your Agency’s operations. Our Mock auditing procedures are similar to what the Home Care Accreditation Site Surveyor will be requiring when they survey your agency for Private Duty Certification. One area of our Home Care Business Startup Process focuses on assisting you with developing the essential marketing pieces you will use to market your home care business. 21st Century’s non-medical Home Care agency Startup Process will provide you with a customized search engine optimization website, tailored specifically for your home heath care business. The goal of your SEO (search engine optimization) website is to have your home health care business achieve first page presence on search engines like Google, Yahoo and Bing. Also included as part of our startup process we will be creating and customizing your home care business brochures and business cards. These marketing materials along with others are yours. We will provide you with 1000 HQ glossy home care business brochures and business cards as well as the design files for all marketing materials. As part of our non-medical Home Care agency Startup Process, we will work with on a one and one basis to successfully develop and implement specialty programs including Fall Prevention & Safety, Low Vision, Alzheimer’s Care, Transitional Care and Memory Care Programs. Our consultants will provide you with the materials and training necessary to implement each program. Lifetime home care business training means that anytime you need home care consulting, have questions or have staff that require training, we are available to assist you at no additional cost. We will review the all clinical aspects of your agency. Admitting patients, review policies, referrals, as well as train you and your staff to understand how to obtain new clients, marketing, medical and emergency scenarios and many other topics. We offer 4 days of live home health care training. Our home health care business training seminars take place quarterly and are available to you, your current and future employees and never at any additional cost to attend. Access to our online Training Academy and Intranet Portal for your home care business and its employees. Includes, but is not limited to home care business training materials, marketing and advertising materials, interactive forum, networking (network with our entire database of existing home care businesses), 24 hour message board, etc. Our certified senior care consultants will provide ongoing support via phone or email at your convenience. Our certified senior care consultants will help you get through the possible challenges in operating a successful home care agency. With that being said, a successful home care agency depends on having all the building blocks in place to be known in their own market area as a provider of quality home care services. Critical to this process is understanding the importance of our internal and external customers. This include our Employees (Caregivers), our Clients, and our Client Referral Sources and how we effectively identify, cultivate, grow and maintain relationships with each. Our coaches will provide you with the necessary assistance in understanding the requirements in providing services in the many areas pertaining to the activities of daily living. You will have the confidence to know that the clinical expertise of 7 degree registered nurses are available when you need them. Several of our registered nurses are former state auditors and CHAP surveyors. With this type of support you will have peace of mind regarding patient care and documentation. We are proud to offer several Veterans Home Care Patient Resource and Support Programs. Our agencies have access to this patient resource opportunity for veterans and their surviving spouses. Approximately 1 out of 3 seniors across the nation will qualify. We have several support and service options designed with your agency’s ability to provide personal and companion services in mind. As the industry leader in home healthcare consulting, we are able to pass on to our clients proprietary pricing that amounts to thousands of dollars in savings. * These discounts are exclusively provided to 21st Century Health Care Consultants clients only. Examples of this will be found in reduced fees such as: $2200 off the normal fees associated with Private Duty Accreditation. $1500 off Re-certification fees. $2000 in savings provided through an exclusive insurance package for our clients. 20% off through the Medicaid Waiver Network 25% off on SEO Program $1500 discount provided by the Institute of Professional Education. Exclusive partnership agreement with ClearCare software. Additional savings agreements in place for our clients with several operational software and billing companies. We guarantee you will get licensed in your state or we will issue you a full refund. This refund is based on you (and any business partners) passing a state background check. Being well-educated is the one major reason for the success of our clients. 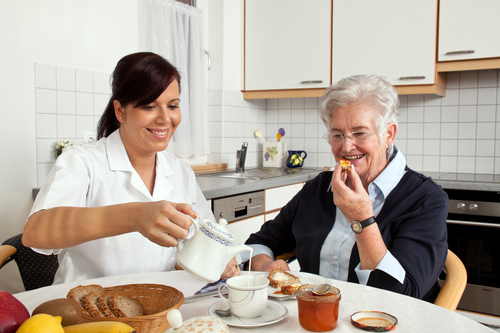 We offer the best home care training and educational resources in the industry. We are considered the industry experts in knowing how to effectively operate, market, prospect and grow a home care business. Ongoing quarterly training programs in theses areas are available through a lifetime training program provided by our Home Care University. We will certify your non-medical home care agency and personnel through Home Care University who offers the industry’s leading home care training certification program. Upon the completion of this 5 day training course you will receive a certificate that will classify your agency as an industry leader and provider of quality home care services. Other reasons for our clients success are our 30 full-time consultants that are available to assist our clients in every area that is required to open and operate a home care business. Our clients are enrolled in our patient referral programs, such as the industry’s only home care discount referral network. This program provides patient referral opportunities through AON / Affinity Insurance providers. Other patient referral opportunities are provided through the enrollment in state Medicaid waiver programs, federal funded veteran programs and the credentialing of agency personnel for other insurance company patient referral opportunities. (Please call us for more information on these unique opportunities. Lifetime access to ongoing support coaches. This is in all areas of your agency operation whether it be to provide services now or in years to come. This includes your agency license renewal, the training of new personnel and the access to our clinical directors as needed. Unlike other home care consultants, 21st Century Care Providers home care consultants will provide ongoing home care consulting to you and your staff and are always available to answer any questions you may have. Why settle for a so-called “membership company” or small teams of 2 or 3 home care consultants when you can work with the largest team of home care consultants in the industry? We have worked with home care agency startups in every state and guarantee our home care business startup process.